In late January, an Administrative Law Judge (ALJ) at the ITC tossed Barnes & Noble's mostly antitrust-related, conspiracy-theory-based, "patent misuse" claims against Microsoft ahead of trial in order to focus on the more relevant parts of the Android-related patent infringement investigation. Previously, the ITC staff ("Office of Unfair Import Investigations", OUII), which participates in many investigations as a third party representing the public interest, had already advocated that dismissal. And today, the Commission, the six-member decision-making body at the top of the U.S. trade agency, has fully backed the ALJ (and, by extension, the OUII). SUMMARY: Notice is hereby given that the U.S. International Trade Commission has determined not to review an initial determination ("ID") (Order No. 32) of the presiding administrative law judge ("ALJ)") granting complainant Microsoft Corporation's ("Microsoft") motion for summary determination as to respondents Barnes & Noble, Inc.'s and barnesandnoble.com, LLC's (collectively, "Barnes & Noble") first affirmative defense of patent misuse. The Commission has also granted Barnes & Noble's motion for leave to the Commission to consider respondents' late filed exhibits to their petition for review of the ALJ's ID. Just to avoid misunderstandings: the second sentence doesn't mean a partial victory for B&N but makes its defeat even greater. It means that B&N's request for a review was denied even though material it belatedly provided was generously taken into consideration (it could have been left unconsidered for failure to meet a clear deadline). 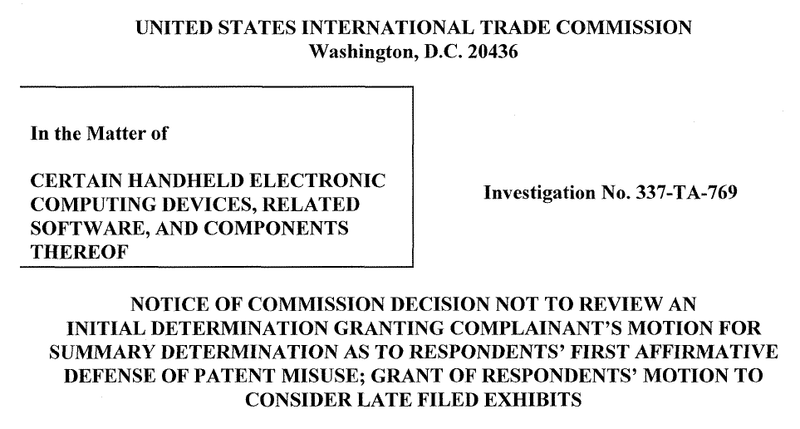 An all-star team of lawyers was unable to convince even one of three different "layers" of the ITC (staff aka OUII, judge, Commission) that its "patent misuse" theories were even worth being discussed at a trial. Even if they had been admitted to a trial, they could have failed there, but by not even deeming them worthy of trial time, the ITC has shown that B&N's claims must be lacking in a fundamental legal sense. Therefore, I would be very skeptical of the prospects of any (legally possible) subsequent attempts by B&N, such as raising the same "arguments" in a federal lawsuit or appealing today's Commission determination to the Federal Circuit, to resuscitate accusations that are, at this stage, dead in the water. Whether Barnes&Noble will be found to infringe any of the three Microsoft patents still at issue in the ongoing investigation is another question. Right before the trial started, the ITC staff (OUII) recommended a finding of no violation, but it sometimes changes its position after the evidentiary hearing, and at any rate, the ALJ and, subsequently, the Commission are not bound by the staff recommendation in any way. By the way, the fact that the ITC staff sides with B&N, at least before the trial, on the question of a violation shows that it's clearly not biased against the Nook maker. From a strategic point of view, the decision on B&N's "patent miuse" claims is, however, much more important. Microsoft has many patents that read on Android (it is asserting more than two dozen patents against Motorola in different litigations, mostly in the United States but some of them also in Germany). It can always start new lawsuits over additional patents until B&N agrees on the need to take a license (as 70% of the market already has). But for the reasons I outlined before, B&N will hardly make headway with its primary defense, "patent misuse", in any jurisdiction. 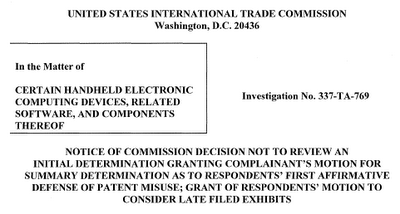 Anyone who doesn't like Microsoft's Android patent licensing program has to oppose the patent system as a whole. Without patents, there wouldn't be patent licensing. As long as there is a patent system, Microsoft is allowed to do what it is doing. That's how one could paraphrase the ITC's outright dismissal of B&N's accusations. Patent licensing and litigation can give rise to antitrust-based affirmative defenses, or even antitrust intervention, but the legal hurdle is rather high for the use of non-standard-essential patents to constitute abusive, anticompetitive conduct as compared to the use of standard-essential patents. There are valid reasons, from a policy point of view, for this. Patents that are not standard-essential can be worked around, even if features may have to be dropped or hobbled. The patents that form parts of standards can also be worked around before the techniques they cover become a mandatory part of an industry standard. A statement recently issued by European Commission Vice President Joaquín Almunia explains this fact, and other related considerations, very well. Let me add that the very process of standard-setting generally raises antitrust issues (because it typically means that the leading players in an industry sit down at a table and use their collective market power to define a future standard others are forced to implement), while a company's independent filing of a patent application is, per se, not a competition issue.